I published a short introduction to gene-gene interactions in Current Protocols in Human Genetics in 2004. Interestingly, this chapter just appeared on PubMed. If you see this and are interested in reading it you should know that I updated the chapter in January. The new 2008 version doesn't seem to be published yet. If you would like a copy of the new version feel free to email me. 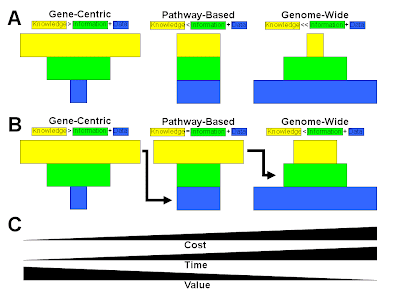 The goal of this unit is to introduce gene-gene interactions or epistasis as a significant complicating factor in the search for disease susceptibility genes. This unit begins with an overview of gene-gene interactions and why they are likely to be common; then, it reviews several statistical and computational methods for detecting and characterizing genes whose effects are dependent on other genes. The focus of this unit is genetic association studies of discrete and quantitative traits since most of the methods for detecting gene-gene interactions have been developed specifically for these study designs. Dr. Massimo Pigliucci from SUNY Stony Brook was here for a visit to Dartmouth this week. I have been a huge fan of his work since reading his book on Phenotypic Evolution: A Reaction Norm Perspective while a graduate student. His views on genetics and evolution and very much in line with ours. In addition to a Ph.D. in genetics and a Ph.D. in botany, Massimo has a Ph.D. in the philosophy of science. His work on the relationship between science and religion is very interesting. I encourage you to explore his websites and to read some of his published work. We will be starting a search soon for a B.S. or M.S. level computer scientist to join my Computational Genetics Laboratory at Dartmouth. If you or anyone you know might be interested please let me know. I am interested in finding an outstanding C++ programmer to work on our cutting-edge machine learning and data mining methods for detecting epistasis in genetic association studies. Bioinformatics experience is a plus. Experience with evolutionary algorithms or other related machine learning methods is a plus. Our MDR software was downloaded 627 times in March. This is a new download record. We greatly appreciate you interest in MDR. Be sure and let us know if you need help. Also, don't forget to read my five-part MDR 101 tutorial that starts in November of 2006 on this blog and continues into December. Version 1.2 of MDR is almost ready. I need to update the manual and then we will post it on Sourceforge.net. Feel free to email me for the new version.